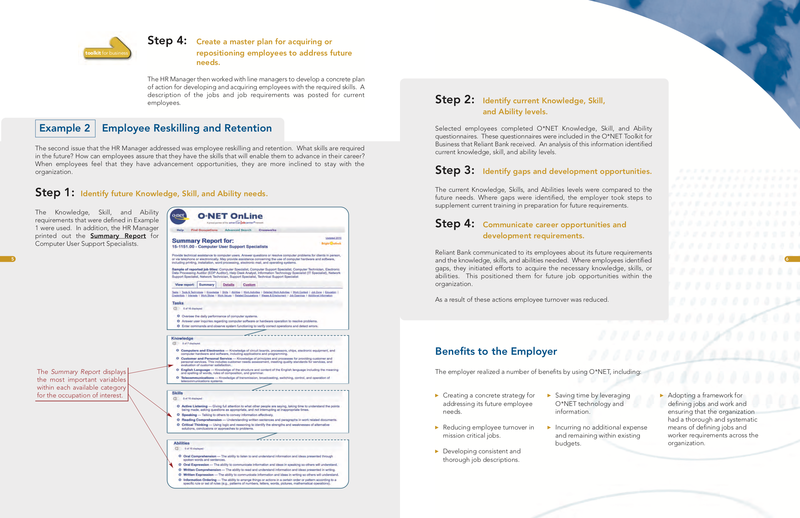 Employers, HR professionals, and job seekers can take advantage of O*NET products and research to achieve their goals. Learn more from the resources below. A brief overview of the features of O*NET, giving basic information on O*NET and how it serves as a resource to assist businesses with everyday needs, complete with brief instruction on how to get started. A guided tour of the features and capabilities of O*NET OnLine, demonstrating the breadth and depth of the information available. This guided tour demonstrates how users can navigate through O*NET OnLine and provides real world examples of occupational and skills searches, or specific details of one or more occupations. This tool also describes O*NET OnLine's many resources on accommodations, disabilities, and workplace issues. 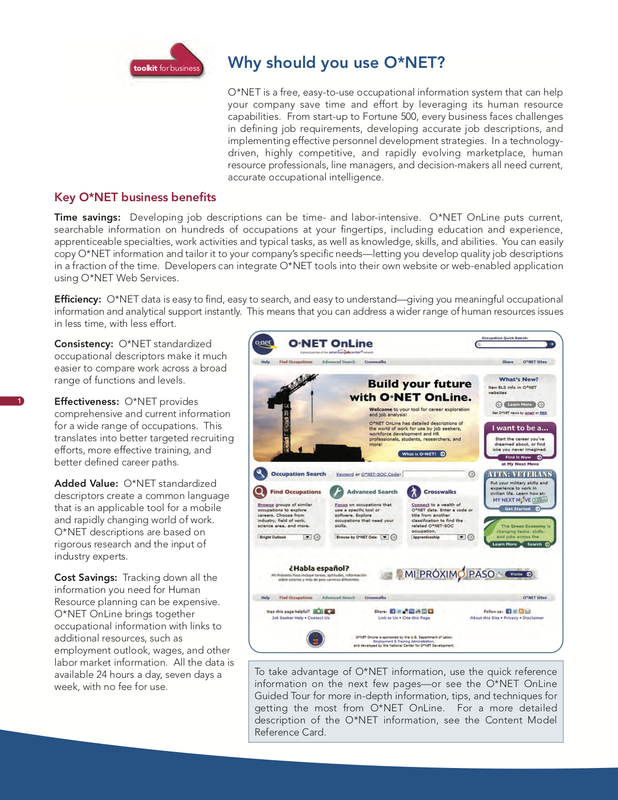 Two case studies provide an overview of how O*NET can be used in specific human resources and management functions. The case studies — Writing Job Descriptions and HR Planning, Employee Reskilling and Retention — provide step-by-step, detailed descriptions to demonstrate O*NET's use in specific business processes. The Job Description Writer is an online tool that uses O*NET data to help employers and human resource specialists write job descriptions. Users begin by selecting an occupation and are prompted to include statements about common skills, knowledge, tasks, work activities and work context to include in a job description. Users have the option to customize and save their final job description to their own computer. Provides both graphic and written descriptions of the conceptual framework that underlies the O*NET database. The O*NET Questionnaires are the generic forms of the questionnaires used in the O*NET Data Collection Program. These questionnnaires are a useful complement to the Toolkit, for better understanding the O*NET database. Visit the Questionnaires page for more information. Employment professionals from around the country use O*NET information to help job seekers and others needing career guidance. Listen to their stories below on a variety of topics. Click any topic to play, download, or learn more about each podcast. Dr. John Rich, Counselor and Director of Career Services at Three Rivers Community College, focuses on O*NET's use with community college students. Dr. Rich uses O*NET resources to present career opportunities to students. He talks about his experiences and zeroes in on at least one student situation to explain in depth how he uses O*NET. Phil Jarvis, Vice President, Global Partnerships, National LifeWork Center discusses O*NET's part in "The Real Game". Facilitated by a teacher, the Real Game allows youth to experience life in the future in terms of a real budget, real decisions about careers, and real solutions when things go wrong. Phil Jarvis explains how the O*NET database is incorporated into The Real Game and how students are directed to real-life careers based on O*NET data. Jasen Jones, Executive Director of the Workforce Investment Board of Southwest Missouri, explains O*NET's role in attracting new industry to the region around Quapaw, OK.
Diana Bailey, Workforce Development and Transition Coordinator, provides insight into how the State of Maryland is using O*NET products such as the Career Exploration Tools to assist at-risk youth as they transition into the workplace. She also shares insights on the use of O*NET's tools in the adult prison system. Cliff Atkinson of EmployFlorida talks about the effects of the BP Oil Spill on Florida's Gulf Coast, the impact on workers, and how O*NET is being used in Florida's jobs database to assist workers displaced by the oil spill. Career ladders and lattices are devices that help people visualize and learn about the job options that are available as they progress through a career. Career ladders and lattices consist of a group of related jobs that comprise a career. They often include a pictorial representation of job progression in a career as well as detailed descriptions of the jobs and the experiences that facilitate movement between jobs. Career ladder/lattices are not necessarily organization-specific; they frequently span multiple organizations because movement within one organization may not be possible. Career ladders display only vertical movement between jobs. In contrast, career lattices contain both vertical and lateral movement between jobs and may reflect more closely the career paths of today's work environment. inform workers about the training, education, and developmental experiences that would enable them to accomplish their career objectives. 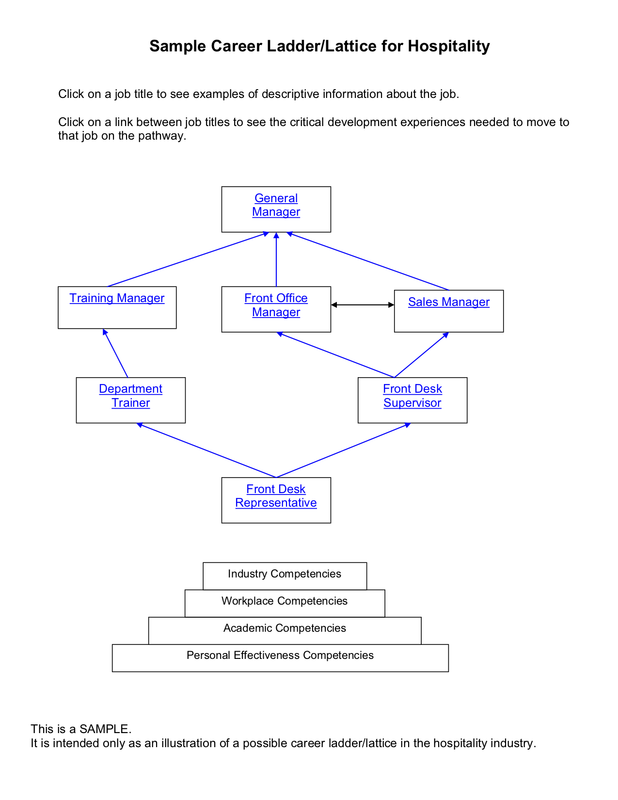 The U.S. Department of Labor's Competency Model Clearinghouse features a tool that enables customers to incorporate O*NET occupations and information within a customized Career Ladder or Lattice. To view examples of Career Ladders/Lattices as well as to access the tool, see the Sample Career Ladders/Lattices page. O*NET® in Action by U.S. Department of Labor, Employment and Training Administration is licensed under a Creative Commons Attribution 4.0 International License.